The opening ceremony of the World Cup in Trampoline and Tumbling took place on Saturday in the National Gymnastics Arena in Baku, Azerbaijan. A parade of flags of countries participating in the World Cup was held, and the national anthem of Azerbaijan was played. 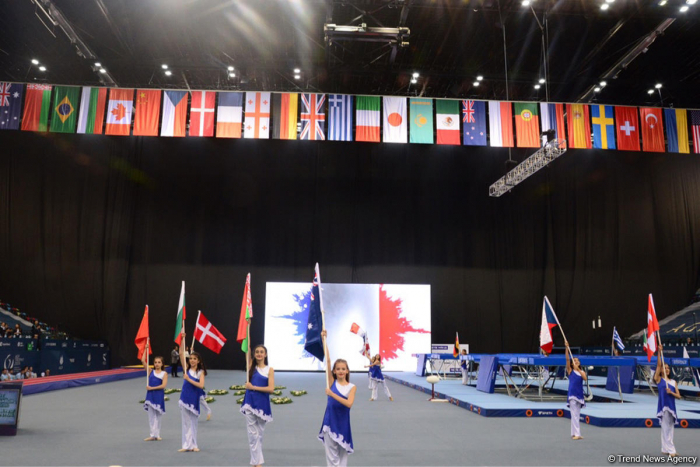 The World Cup in Trampoline and Tumbling is set to run from February 16 to 17 in Baku. Some 200 gymnasts from 30 countries will take part in the championship. Such athletes as Uladzislau Hancharou, Rosannagh MacLennan, Jason Burnett, Dong Dong, Gao Lei, Dmitry Ushakov and Bryony Page will compete in this World Cup. Azerbaijan is represented by Veronika Zemlianaia in the individual program, Ruslan Aghamirov, Ilya Grishunin and Oleg Piunov in the individual and synchronized men's programs, and Mikhail Malkin on the acrobatic track at the World Cup. Trend presents photos from the opening ceremony of the World Cup.